We are looking forward to seeing you for your appointment! At DL Hairbar, we strive to provide you with the most relaxing and peaceful hair experience you can find. To achieve this, we ask that you put your phone away while you are in the salon to help you disconnect and help us work impeccably without distraction. We hope that you can come on time to your appointment to receive the full benefit of your appointment, including a consultation and relaxing head massage. Please allow 1.5 hours for each service. If you are pressed for time, please let us know when you book your appointment and when you arrive at the salon, and we are happy to accommodate you. 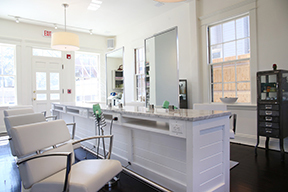 Our overall policy is to provide you with a relaxing and rejuvenating experience at DL Hairbar, and we work tirelessly to cultivate this atmosphere in the salon and give you top of the line service.